Telecoms rescue equipment for mast and tower climbers. Equipment for ladder climbing, work positioning, fall arrest, tower rescue and light lifting for riggers, mast and tower climbers. 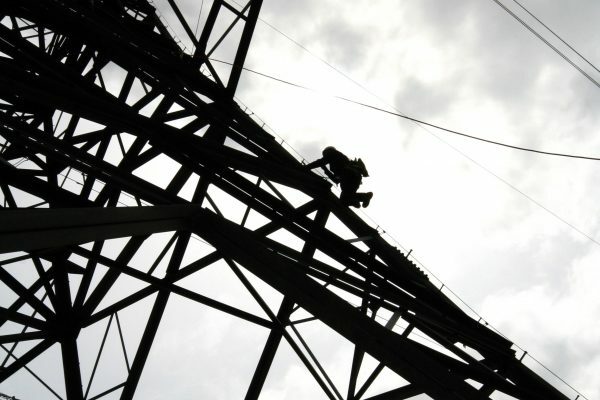 Telecoms workers need a wide range of fall protection equipment, all of which is available in ready to use work kits. Typical requirements include work positioning, fall arrest (with both lanyard or vertical system), adjustable restraint equipment for roof safety and rescue and evacuation systems. The heightec Rigger’s Kit contains the smooth action PIRANHA adjustable belt, DUON-Air advanced safety helmet, versatile MATRIX combination harness and high specification ELITE twin energy absorbing lanyard. The DUON provides ultimate head protection for work at height and confined spaces. The helmet features a unique chinstrap buckle with variable fastening power, allowing wearers to be fully compliant in complex environments containing different, changing hazards. The MATRIX leg loops now self adjust, preventing one leg taking all of the users weight when suspended. The shoulder strap configuration ensure a good fit with maximum comfort and security for the user. Our ELITE lanyards now feature our brand new compact absorber design which has a replaceable neoprine cover, tamper evident but with increased durability. ELITE lanyards also feature a built-in suspension intolerance relief footloop that deploys automatically, providing support for both feet in the event of a fall. Our brand new NEON harness has a high load rating (140kg) and is designed to ensure a good fit, giving maximum comfort and security. The chest rings and articulated hip section align the webbing to give greater freedom of movement. New features include integrated lanyard parking points at the shoulder which breakaway in the event of a fall. COMING SOON… the new VANTAGE™ 4:1 Locking Casualty pulley for transferring a casualty onto a rescue system without cutting. The cam automatically locks allowing simple and safe rescue procedures. The new woven plastic sheath provides cut and abrasion resistance. The sheath is highly compressible, preventing snagging between cord or pulleys. The Roof Workers self contained restraint system is available in a range of lengths, as is the TowerPack rescue system, which features the POWERLOCK double action descender and optional line lengths of 50, 100 and 150 m.
Our lifting kits feature our premium lifting devices which are lightweight, intuitive and offer a mechanical advantage for lifting, lowering and positioning loads. Our TORNADO features a one way bearing in the main cam, which allows the device to rotate freely when lifting but lock when lowering. View the full specification of our lifting kits and devices. All heightec kits come complete in a KARI transport bag. The KARI range offers all the features of traditional dry bags but with increased protection. The range is WLL rated, and tested and certified for high loads. The new style of bags have stronger seams which have been RF welded for enhanced strength and the reinforced cylindrical base offers exceptional durability. MATS Telecom Climber, Roof & RF Hazards – brand new four day course aimed at new starters in the Telecoms industry who are required to access all parts of a typical comms structure and roof area. Use of Portable Abrasive Wheels – half day course for those who need to fit and use abrasive wheels on disc grinders. Covers selection and marking of abrasive wheels, pre-use checks, mounting and safe use.